People who have no special interests in medusae may think that jellyfish don't live in freshwater. 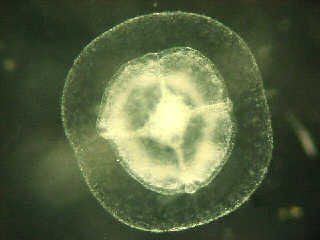 In fact, there is a freshwater jellyfish, called Craspedacusta sowerbyi but it isn't very common. Although the species is not rare, their appearance is sporadic and sometimes reported as a local news item by newspapers. I obtained this strange animal through the courtesy of Ryuta Miyakawa. He is a Japanese amateur and veteran in keeping various aquatic creatures. He found this medusa in his aquarium tank in which he rears Hymenochirus boettgeri (frogs). He also found the polyps on the ceramic tips of the water filter, and has reared them for some time. Pictured above are two female medusae of C. sowerbyi. They are grown from polyps to adult medusae by Miyakawa. 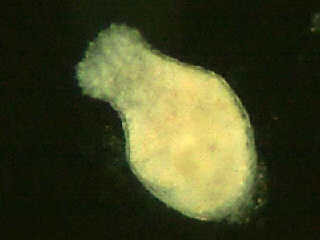 The diameter is about 9mm and the four white round objects are the gonads. For your information, to grow the species to this size is very difficult. He tried various ways. But in nature, medusae usually only grow up to 2cm in diameter or so. He sent me some polyps and medusae and I have taken some pictures of them. I think these will interest you a little. This is a baby medusa. 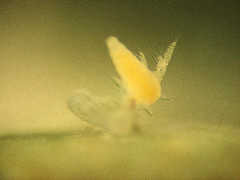 The diameter is about 1mm. Because of the long distance from Miyakawa's home (over 250km), this baby medusa was not alive when received. The tentacles were missing and no movements were observed. Next morning this tiny medusa had disappeared in the bottle. Miyakawa feeds them brine shrimps (the salt must be removed), but he thinks some rotifers are better food for babies. As you know, the medusa is only one stage of the life cycle of jellyfish. They stick on substrates and live as polyps before they become medusae. The lefthand picture shows the ceramic tips on which the polyps were attached. I can't find the polyps with the naked eye. I think the word "polyps" remind you of Hydra. But these polyps don't look like them. The size is much smaller and no clear tentacles exist. However, like the Hydra they are also a carnivorous animal. They catch prey by nematocysts and swallow them. The next three pictures show this process. Two polyps made a colony, and (1: left) one polyp catches a brine shrimp. After one hour, (2: center) the prey was taken by the polyps. 12 hours from the catch, (3: right) two polyps share a brine shrimp. The gut of the polyps in a colony is continuous. (Enlarged images available). Because of their small size, the collection of polyps in nature is very difficult. (Please tell me any cases of successful collection). But the rearing of them is relatively easy when you learn the ropes. The polyps reproduce asexually, to form "frustules". They move slowly. The frame interval of this GIF animation file is one hour. This movement of the frustule helps the dispersal of polyps in a site they live in. Some researchers are working on this problem. The frustules settled down on the surface of the substrate and became polyps. 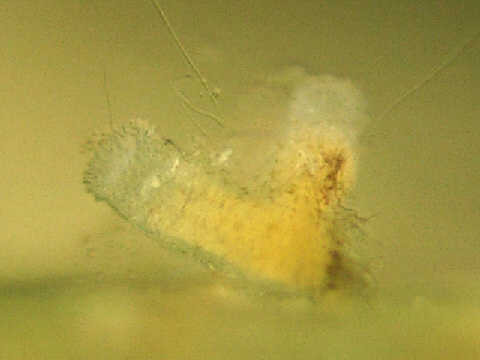 Picture (left) shows a new born polyp on the bottom of the watchglass, it's approximately 0.3mm long. Around the "mouth", something like traces of tentacles are seen. These are practically tentacles. It is said that the nematocysts are discharged around here. 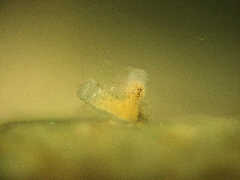 In a good condition, new polyps grow and undergo budding. Usually, a colony is made of two or three polyps. One day, the polyps make special buds for medusae. It is said that a change of temperature induces this, but I hear the details are not known. Comments to the author Gen-yu Sasaki welcomed. Also see Freshwater Jellyfish; sexual reproduction . I thank Ryuta Miyakawa and other members of the "jfish-ML"(a Japanese mailing list on jellyfish). This page could not have been written without their help for me and love of jellyfish. I also express my gratitude to Wim van Egmond and Micscape editor, Dave Walker. They encouraged me to write this article and helped improve the English text. 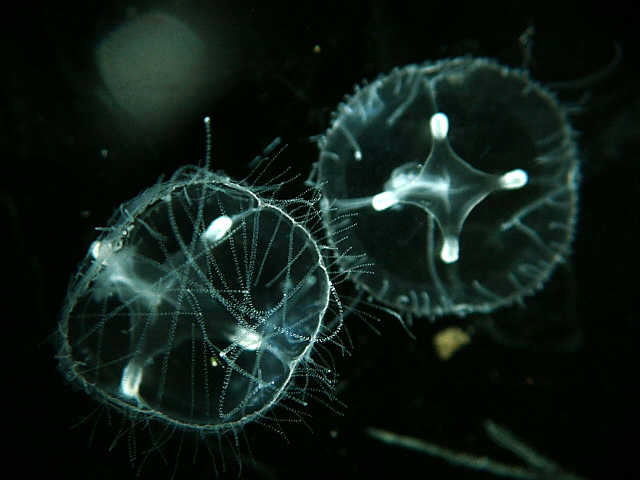 This site is devoted to freshwater jellyfish. Good for those who are interested in this species for the first time. Recent research results in Dr. Peard's laboratory are also available. 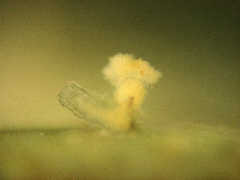 Ryuta Miyakawa: "Mamizu-Kurage" (in Japanese). There are pictures and sketches about their rearing, development, and so on. He collects information about this species. Slobodkin, L. B. and Bossert, P. 1991. The Freshwater Cnidaria — or Coelenterates. Pages 125-143 in: James H. Thorp and Alan P. Covich Editor. Ecology and Classification of North American Freshwater Invertebrates. Academic Press, San Diego. Visit Gen-yu's home pages which illustrate an interesting selection of freshwater life and other organisms. Richard Howey's article 'Things that don't belong where they are' provides an overview of some freshwater examples of organisms more commonly associated with marine habitats. Mirrored with permission from the author's home pages.